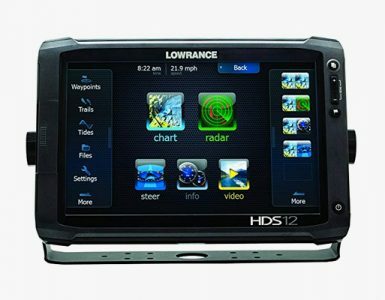 Lowrance HDS 5 is a combo unit made of GPS chart plotter and fish finder from the product line of Lowrance’s high definition series. This unit is very compact and versatile and comes with a small footprint, making it perfect for anglers who are searching for a multifunction unit that is also space saving. One of its features, the SolarMax Plus display, offers high-quality images that are both clear and crisp in daylight. It also comes with a fully adjustable backlighting for the keypad and screen, which is perfect for low light conditions. Lowrance HDS 5 fish finder also comes with 30,000 watts of power which enables the transducer to penetrate into the waters even to depths up to 5000 feet. With all of this power, it also comes with necessary tools such as FishTrack, FishSymbol ID, as well as Hyperscroll. Everything will surely be noticed under your radar. Does not have 7 soft keys which could provide access to various settings and options. The Lowrance HDS 5 packaging comes with the display unit, dual-frequency transom-mount transducer, installation manual, operations manual, quick start guide, as well as a combination of NMEA0183 power/data cable. 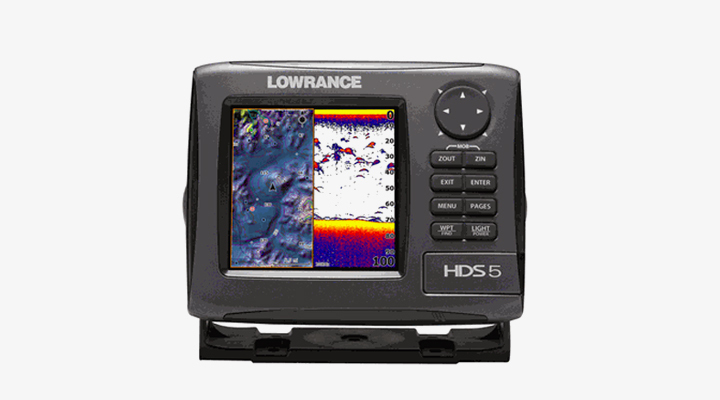 As an alternative, the Lowrance HDS 5 may be bought as a standalone chart plotter or a standalone fish finder. Lowrance HDS 5m is the chart plotter version, while Lowrance HDS 5x as the fish finder version. The cartography options also include Nautic insight, lake insight, as well as a Navionics world base map. Also, the Lowrance HDS 5 comes with a single chart card slot and may also use Platinum+ and Navionics Platinum charts, including any Navionics lake insight cards. It also comes with an accompanying gimbal bracket with which the Lowrance HDS 5 can be mounted to the test rig. At the same time, it features a removal front bezel that makes mounting of the panel easy without the need for any further hardware aside from the standard requirements. 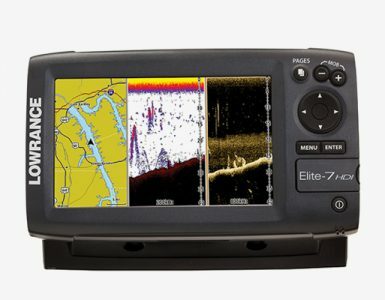 There are several options when it comes to fish finder options. As a matter of fact, there are other players in the market from other brands. One of those is the Ice 45 model from Humminbird. This particular model has been long awaited in the fish finder industry and has grabbed the attention of many anglers. It is equipped with the very first backlit LCD within the flasher dial, offering the real-time update when it comes to sonar response, together with the convenience of having easily readable automatic depth scale as well as digital depth. Another model under the same manufacturer of Lowrance is the X4 Pro. It is also a standout because it has the capability to cover more water area. It allows users to enjoy a more pleasant and successful fishing trip. This particular model is included in the series of Lowrance fish finders, which is great for beginners. This is an inexpensive way to enjoy fishing at its best. Comparing the options that are available with the capabilities of Lowrance HDS 5, the latter is still the better option. It comes with a set of features that is perfect both for amateur and professional anglers. All in all, if you are searching for a good option for a tool that can help you with your fishing activity, there is no doubt that the Lowrance HDS 5 is the best choice you have. It comes with features that shout of quality. For instance, when this unit is connected to the optional devices, it can provide a display of Sirius weather and radio, as well as engine gauges. Also, the display comes with an internal GPS sensor, but the unit may still make good use of an optional external GPS sensor if desired or needed. 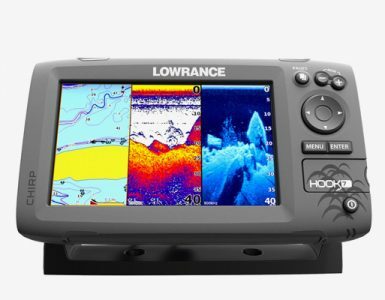 At the same time, Lowrance HDS 5 also comes with a 3.6 inch (width) x 3.6 inches (height) display screen which measures 5 inches on its diagonal, while carrying a resolution of 480 x 480 pixels. The display screen is sharp, bright, and typically easy to read. At times, however, particularly on the chart page where there is a lot of information and data displayed, you may need to view it up close in order to have a better view of all the detail that is available on the screen. On the other hand, if it is viewed right from the screen, it keeps its brightness whether or not the user is using polarized glasses. Even at seemingly steep side angles, there is no problem regarding reduction or darkening in readability. At daylight, this unit is also great because you do not have to worry about screen fogging which may limit you from viewing the details on the screen. This unit also comes with both a day and night color palette. The option for the night palette can change letters and numbers shown on the screen to a color that is darker for easier viewing at night. Overall, there are great points in the Lowrance HDS 5, which serve as its assets. For instance, it uses eight push buttons, as well as a keypad which can assist in manipulating onscreen menus as well as other control functions. The page combinations and page screens are set with the use of the keypad, page key as well as the enter key. Users may choose from one of five pages. The page menu has a slick appearance that is both fun and very easy to use as well. With a Lowrance HDS 5 unit with you on your next fishing expedition, you will certainly enjoy the adventure. Lowrance has recently come out with their Gen2 product line for their HDS fish finders. Lowrance users around the world have spoken and Lowrance, the company, has responded. The Gen 2 (Generation 2) is the same great HDS fish finder as before, but with some much needed updates. One of the downfalls of the Lowrance HDS 5 Gen 2 compared to its competitors is that the screen seemed to take longer to load. With the new processor, panning the screen is lightning fast. This is the best new feature of this unit in my opinion. But maybe not the coolest. StructureMap View is one of the neatest things I’ve seen in a while. StructureMap gives you the ability to overlay your imaging onto your mapping. If you are looking at your map window, and you have StructureMap turned on, it will automatically draw the imaging along your path as you move. With this feature, you can drive along your favorite fishing spot and record images onto your contour map, and view them on your computer at home or while in the boat. This is truly a great tool for fisherman, divers, and all boaters alike. The optimal speed for using StructureMap is between 3-4 miles per hour. The TrackBack feature allows you to move your cursor over a spot on your imaging, mapping, or StructureMap, and create a waypoint. Imagine yourself driving over that spot you’ve always wanted to fish. With StructureMap, you can drive over it, and look at your imaging for any great fish cover, or even images of fish, then you can move your cursor over the fish on the image and create a waypoint. This makes it easy to come back to this exact spot and really key in on the exact spot those fish are sitting. I’ve had a chance to play around with this unit, as well as the other HDS units, in a store and was truly impressed with it’s capabilities. I believe that anyone who purchases this is going to be happy with their investment. It gives you the latest and greatest that technology has to offer fisherman. I honestly can say I recommend the Lowrance HDS 5 to anyone looking for a new unit.